New York Rangers President and General Manager Glen Sather announced today that the club has acquired defenseman Anders Eriksson from the Phoenix Coyotes in exchange for goaltender Miika Wiikman and a seventh round selection in the 2011 NHL Entry Draft. Eriksson will report to the Hartford Wolf Pack of the American Hockey League (AHL). Eriksson, 35, was originally a first round draft pick, 22nd overall, in 1993 by Detroit, and captured the 1997-98 Stanley Cup Championship with the Red Wings. Defenseman Anders Eriksson will be joining his ninth NHL team in the Rangers. The former Red Wings first-rounder has played in nearly 600 career NHL games. The 11-year veteran has skated in 564 career NHL games with Detroit, the Chicago Blackhawks, Florida Panthers, Toronto Maple Leafs, Columbus Blue Jackets, Calgary Flames and Phoenix Coyotes, registering 22 goals and 152 assists for 174 points, along with 242 penalty minutes and a plus-41 rating. Eriksson established career-highs in goals (seven) and plus-minus rating (plus-21) during the 1997-98 season, while he recorded a career-high in assists (25) and points (28) with Chicago in 1999-00. In addition, he has skated in 36 career post-season contests, registering six assists with 18 penalty minutes and a plus-five rating. Eriksson tallied a career-high five assists and plus-seven rating in 18 games during Detroit’s championship run in the 1998 Stanley Cup Playoffs. The 6-3, 224-pounder has registered three assists in 12 games with Phoenix this season, after signing with the Coyotes as an unrestricted free agent on December 21. He tallied three assists and a plus-two rating in his first seven games with Phoenix, from December 21 vs. Columbus to January 5 at Edmonton. In addition, Eriksson appeared in 10 games with the San Antonio Rampage of the American Hockey League (AHL) prior to signing with Phoenix, registering one goal and three assists, along with two penalty minutes and a plus-three rating. Internationally, the Bollnas, Sweden native has represented his country in several tournaments. 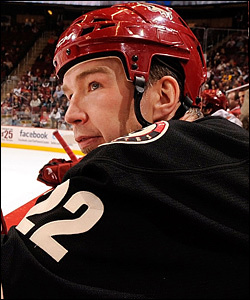 He helped Sweden capture the Bronze Medal at the 1999 IIHF World Championship, registering three assists in 10 games. He also won the Silver Medal at the 1994 IIHF World Junior Championship and the Bronze Medal at the 1995 IIHF World Junior Championship. Eriksson recorded three goals and seven assists for 10 points in seven games during the 1995 IIHF World Junior Championship, en route to being named to the Tournament All-Star Team.